As I mentioned in the first part of his two part post, I’m basically following Dimitri Ehrlich’s lead when I say that I might have prematurely judged Perry Farrell. 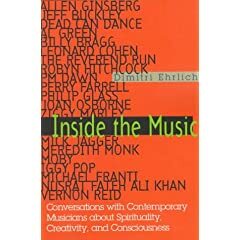 Within the first lines of his introduction to his interview with Farrell beginning his book Inside the Music, Ehrlich confesses that he was a bit behind the times when it came to appreciating the artist behind his flamboyant and “artistic” rock n roll performances and vision. And Farrell’s role as festival organizer is a different thread that I’ll unravel later. Even though I’m still not completely won over by or convinced of Farrell’s artistic vision, after reading the 1997 interview, I do have a new take on some of the past Farrell performances I’ve reviewed and I’ve rethought some of my previous impressions of his m.o. as a performer and festival creator. I attended and reviewed, Lollapalooza in 2006 and 2007 and each year I was taken aback by the heavy presence of corporate involvement and sheer magnitude of the whole experience and I’ve always questioned whether or not a festival like Lollapalooza is good for music or for the fan’s live music experience. While I do see some of Farrell’s comments about his vision and performance and vision in this interview as being present in the Lollapalooza experience, I still have to wonder how different his 1997 vision is from his 2008 vision. I know all creative minds evolve and I wonder about his evolution. I do have to retract some o f my original harshness about his performance as Satellite Party when he talks in depth about his mental and spiritual approach to performing. I did see some of his passion to “become the barrier” between the crowd and himself during each time I saw him perform, so I’ll cut him some slack when I called the show glitzy and showboaty. And when Ehrlich asks, Farrell clearly explains his approach to a performance, and if this remains true today, Farrell is probably is a class by himself when it comes to working to master his emotions as a performer and wanting to be as unpretentious with his fans as possible. Read these excerpts and judge for yourself whether or not Farrell has remained true to his 1997 artistic vision of success and Karmic law of “redistributing his luck” as Ehrlich begins by asking how Farrell has wrestled with the battle between building up the artist ego at the expense of the fan’s self-esteem. When I was performing I used to wonder if people liked me and I tried very hard to please them. I had this feeling that I wasn’t fully whole and the audience was gonna tell me whether I’m good or not with their applause. Now my attitude is that people wouldn’t be there if they didn’t enjoy it. So I have to go up there loving what I gonna do, not dreading it. I have to look at the audience with open eyes and give ‘em everything in my body. Ehrlich: “Another drawback to the overtly theatrical side of rock performance is that, although the potential for entertainment value may be higher, the artist is also setting up more of a barrier between the artist and the audience. Ehrlich closes by summing up the Farrell concert experience by noting how Farrell’s concert performance and songwriting style are similar to a practice known as “automatic writing” and it’s in that creative context that Farrell seeks to live as an artist and truly connect with a live audience. After I read this interview, I went back and tried to think if I misjudged and mistook a cheesy Farrell moment for a genuine moment of artist-to-fan connection. I didn’t find a specific example, but from now on I will certainly, especially when I attend Lollapalooza in a few weeks, look at Farrell’s and other artists attempt to truly connect with their audience. Now it’s your turn. Take a look back at some of the shows you’ve been to and let me know if you’ve ever left the show feeling like your self-esteem was the victim of the artist’s ego, or if you’ve misjudged the performance. I know I have and I’m looking forward to hearing your stories as well.